cream that's prepared fresh daily with the highest quality of kosher ingredients. Treat yourself today with our decadent homemade ice cream in a large variety of flavors. At Ice Cream on Grand, you are sure to enjoy the great atmosphere, friendly service, and affordable prices. Take your taste buds on an unforgettable journey at Ice Cream on Grand. As a leading provider of homemade ice cream, novelties, and ice cream cakes, we take pride in offering the best products. We are dedicated to serving the needs of our customers each and every day. 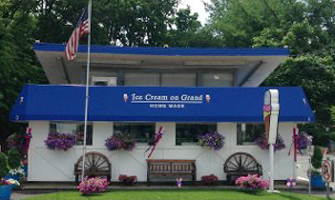 This location has been a landmark for ice cream lovers for more than half a century. Always improving our recipes, we create fresh and tasty super-premium ice cream flavors, keeping true American ice cream making tradition for years to come. We have very close ties with our local community and support various local events, not just in Englewood, but in the neighboring towns as well. Many of our customers were kids when we established our business. Now they are coming with their own kids to share the delicious taste of childhood memories with them. Most of our employees were our customers since a very young age as well. We cherish our old friends, and we're looking forward to making new friends! Hope to see you soon!